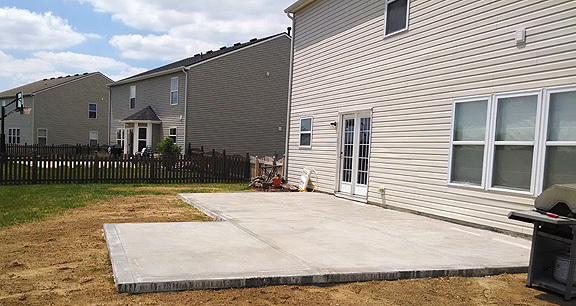 Project obstacles and solutions: Brick and Bloom Landscape was contracted to pour a 9.5 yard residential patio. They had used another ready mix concrete producer, but found the mix very hard to work with. It was difficult to move and set up too quickly for their crews to finish. The job had to be torn out and re-poured. Brick and Bloom turned to IMI and discussed their need for a high quality concrete and their restrictions in terms of set times. They needed to deliver the concrete via a Bobcat loader, so the last bucket load off the truck had to be as workable as the first. Slump was critical to their production. They needed a concrete mix that would produce a fine paste for a broomed finish. Finally, they needed a mix that would be easy to finish. Their previous experience had caused their crew to overwork the concrete, which left very little paste on the surface. This resulted in popouts and exposed coarse aggregates in a short time after the job was completed. IMI suggested they use imix Drive Plus delivered with an 8 inch slump at 4,000 psi. Designed specifically for residential flatwork, the imix Drive Plus set up in three hours, giving the Brick and Bloom crew plenty of time to place it and screed it before final finish. It consolidated well and produced a great looking patio. For more information on imix Drive Plus, click here.